Montroyal Term 2 Programs: Register NOW! 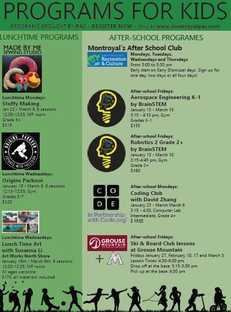 There are many exciting programs planned for your child at Montroyal for Term 2 Made by Me, Parkour, Coding Club, Ski & Board Club, Stem 360 and Robotics. 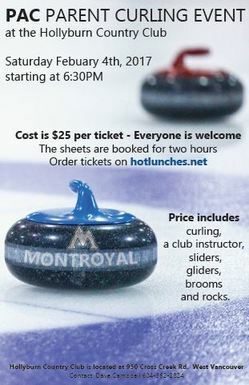 ​Montroyal is now on Twitter! Follow @Montroyal_nvsd to ensure you stay informed. Please note: If you tag @montoyal_nvsd, please ensure that images containing students are blurred or do not contain photos of students. ​Stay tuned! Information & dates are coming soon. January 18 MPAC Meeting "Emergency Prepardeness"
Our first PAC meeting of 2017 will be at 7pm - 9pm and will focus on Emergency Preparedness. See HERE for details. Early dismissal for teacher collaboration. ​The Ministry of Education is adapting the curriculum in B.C. schools so kids learn the skills they need to succeed. This means they also need to develop a new reporting approach. Currently, the progress of your child is reported in many different ways (report cards, parent-teacher meetings etc.). Until February 28, 2017, parents can submit your thoughts on reporting online at engage.gov.bc.ca/yourkidsprogress. Community meetings will be held in across the province over the coming months so parents can ask questions and share input. Check the website for times and locations. The ultimate goal is to develop a student reporting process that gives families a deeper understanding of their child’s progress at school. ​The Ministry will gather feedback and share their plan next June. ​For more details on the new curriculum, please visit http://www.curriculum.gov.bc. ca.